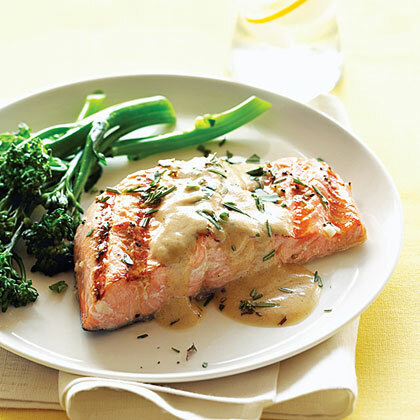 The Dijon and dry white wine give this sauce a vibrant flavor that pairs well with the richness of grilled . Prepare a grill for high heat (450° to 550°; you can hold your hand 5 in. above cooking grate only 2 to 4 seconds). In a small bowl, combine garlic, salt, 1/2 tsp. pepper, the oil, and lemon juice. Brush mixture over salmon, then cook, turning once, until done the way you like, about 6 minutes total for medium. In a small saucepan, melt butter over medium heat. Stir in flour and cook until starting to brown. Whisk in remaining 1/2 tsp. pepper, the paprika, milk, mustard, wine, and 3 tbsp. water. Cook until simmering, then spoon over salmon and sprinkle with herbs.